This RARE item will appeal to baseball & golf fans, as well as avid memorabilia collectors. 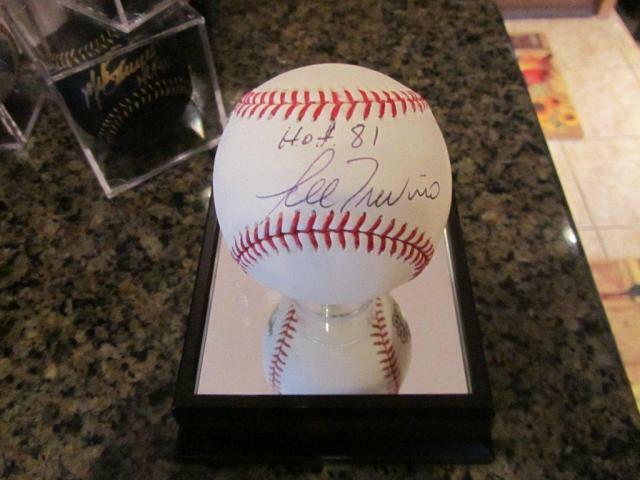 This is an official 2009 World Series Baseball with logo autographed and inscribed by Hall of Fame Golfer Lee Trevino. Above his signature Trevino inscribed, "HOF 81" - the year he was inducted into the World Golf Hall of Fame. Purchase this ball and receive a Certificate of Authenticity from James Spence Authentication. Due to the rare nature of this item we will charge your credit card for the full price immediately upon taking your order to ensure we reserve the ball for you. We will confirm your order by Email. This ball is not game used. Item is in stock and ready for immediate shipping.